Chairman of the Heart Foundation R.E Barnes accepted the donation from the bank's Sponsorship Manager, Indira Rolle. 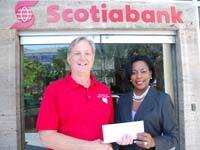 NASSAU, Bahamas – Scotiabank Partners to Assist Children Born with Heart Disease – Demonstrating its commitment to being socially responsible, Scotiabank announced its partnership with the Sir Victor Sassoon Heart Foundation as Platinum Sponsor of the 2011 Heart Ball. The Heart Ball is an annual event held to generate funds to assist Bahamian Children who are born with congenital abnormalities of the heart and require surgery.